This system is designed to introduce the new user to the Serge concept of Patch Programmability. Patch Programmability allows for multiple functions from a single module depending on how the module is patched. The Teaser Serge intentionally leaves out traditional modules such as VCOs, VCFs and VCAs but it is still an amazingly powerful grouping of modules because of Patch Programmability. 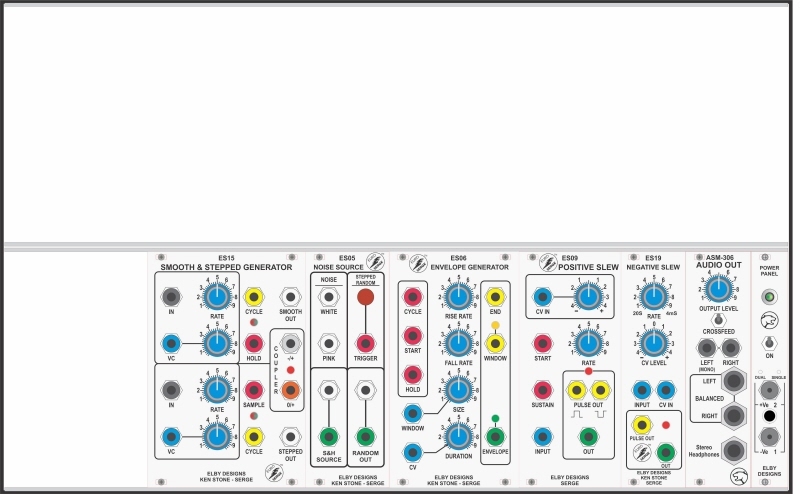 For instance, in The Teaser Serge there are 4 modules that can be used as VCOs, 2 modules that can be used as VCFs, 2 modules that can be used as VCAs, 2 modules that can perform frequency division, 3 modules that can provide portamento, 4 modules that can be used as LFOs, 3 modules can provide traditional envelopes. More selected functions that Patch Programmability provides in this system are S/H, random voltages, zero crossing detection and envelope following.